Graded motor imagery is a step by step process which helps train movement disorders. It is a therapy which includes imagining oneself perform movements without essentially carrying them out. As we know, every organ in our body is made up of small structures called cells. The cells of the brain are called neurons and these are connected to each other like electrical wires forming various circuits and pathways.In order to achieve any movement, for example, picking a cup with your right hand, the brain activates many of these neurological circuits and pathways, thus making movement smooth and pain-free. In a patient with brain injury, movement is affected due to disruption of these electrical pathways. Graded motor imagery helps recovery by creation of new neural connections and pathways, eventually leading easier mobility. Move the patient to right or left side and get them to say which side the movement occurred. Progress can be made to various different body parts. Various mobile applications are available which can be downloaded to help retrain difficulties determining left right movements. Make patient focus towards the neglected side by giving instructions to focus and visual cues. Explicit Motor Imagery is the process of thinking about the movement without actually performing it. Twenty-five(25%) of the neurons in our brain called as “mirror neurons” fire up even when we think about or even see an action. For example, even if we think about picking up a cup, a lot of neural connections which reflect lifting the hand and reaching for the cup would fire up, thereby establishing new neurological pathways. A movement is to be broken down in steps, for example while reaching a cup of water, the placement of the cup is observed; then the action of reaching is planned i.e., lifting the shoulder, extending the elbow and finally gripping the cup.The patient has to visualise this process and imagine himself doing the same. Patients can train anywhere, sitting in car, while in bath or even while sitting idle. Watching others perform these movements also helps re-train quicker. It is a process of tricking the brain to perform a movement. 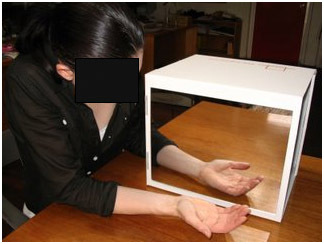 The non-affected limb is placed in front of a mirror and made to perform any action (example: picking up a cup). This tricks the brain into believing that the affected limb is performing the action (reflection of non-affected limb). The affected limb is placed inside the mirror box after getting rid of any restraints like watches, belts, etc. Start with exercises which involve tiny movements of the non-affected side. Observe these movements and progress as able. The process should be pain-free. If pain persists, take a break and restart. The idea of this therapy is “move to improve”. To summarize, we get the brain to make a mental picture of the movement and make the idea of moving comfortable. Once this is achieved, we progress for small therapeutic movements to larger ones which we require in our day to day life. Along with the guidance of a trained therapist and appropriate strengthening, we train functional activities thus getting back to our normal routine pain-free. So move, improve, get well soon. Happy exercising!